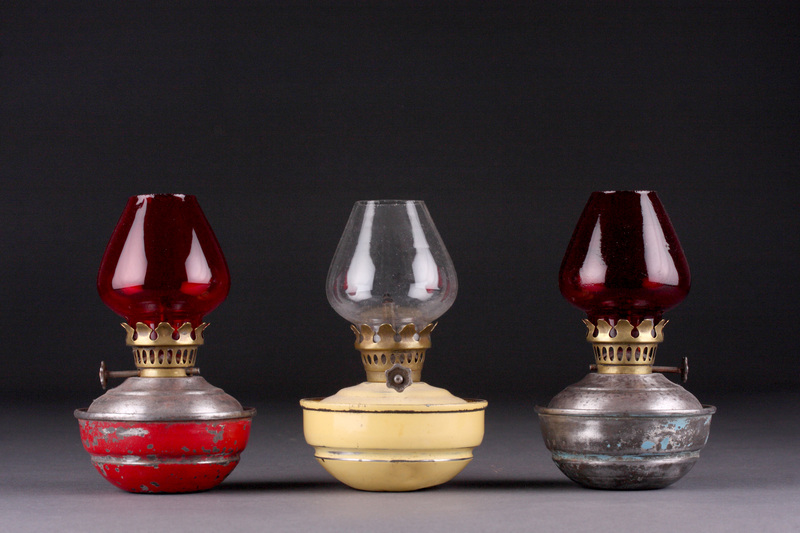 Paraffin lamps with weighted metal bases; three colours: red, yellow, turquoise. Glass colours: red, clear, dark red. I removed a lot of rust from the metal bases of BFK013 and BFK015. The internal parts were badly rusted but still in working order. The red glass suggests a direct association with the sacred heart picture hanging in the kitchen, for which there was no customary electric red light in situ. The colour turquoise also features in the framed print. BFK013-015 (Digital Photograph: Brian Mac Domhnaill, April 2015). BFK013 now in the private collection of CCAD security guard Nicholas Sommers.